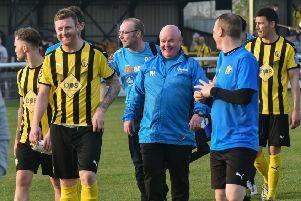 It would be premature to talk of promotion bids on the back of 90 minutes, but Leamington at least showed one quality which all title-challenging teams need, writes Paul Okey. The ability to grind out a victory when not playing well is the hallmark of all successful sides and, particularly after the interval, Brakes were distinctly second-best to a decent-looking Chesham side. But while the visitors failed to take advantage of two or three gilt-edged opportunities, Leamington had an ace finisher in their ranks, with Ben Mackey conjuring up a goal out of nothing to cap a memorable third debut for the striker. On a scorching day at Harbury Lane, Ben George and Rob Ogleby made their first league starts for the club, with Tony Breeden and Jamie Hood joining Mackey in make their first competitive starts after spells away. And although Mackey was to prove the match-winner, it was Breeden’s contribution which ultimately ensured Brakes’ return to the Southern Premier League was a winning one, with the keeper producing two outstanding saves from point-blank range as Chesham turned up the heat after the break. His first involvement was much less significant, however, with the former Solihull Moors keeper able to watch Dave Pearce’s shot drift past his near post after a pacy counter from United. Richard Taundry curled a free-kick over the bar at the other end but most of the threat was coming from the Generals, with Breeden doing well to hold on to a fierve drive from Sam Youngs. Brad Wadkins failed to get his head on Brad Wadkins’ inviting cross from the right, with only the smallest of touches needed to divert the ball past an exposed Breeden. The lively Youngs was then unable to get any purchase on his shot after scything through the home defence. Despite the away side pressing, it was Brakes who struck the decisive blow in the 28th minute. Mackey received the ball from Jack Edwards on the edge of the box and produced a neat burst of speed to escape his marker before guiding a shot into the corner of George Legg’s goal. It was a goal completely out of keeping with Brakes’ play up to that point and was to prove one of only two shots on target for the hosts all afternoon. But, with Hood proving a formidable presence at the back, it was a lead they comfortably held on to until the interval. In fact, it was ten minutes into the second half before Breeden was called into action again, getting across well to hold on to an acrobatic effort from Bruce Wilson. Four minutes later, Breeden was in the right place to keep out a close-range header from Youngs, while at the other end, Legg was at full-stretch to tip an Edwards header out for a corner, though the ball looked to be heading well wide anyway. Leamington had an anxious moment when Joe Magunda’s lunge in the box failed to make contact with the attacking player and seconds later appeals for a penalty were waved away when a cross appeared to strike a home elbow. An equaliser seemed inevitable and, after neat skill from Youngs on the right, Matt Taylor got in front of his marker eight yards out, but his bullet header was straight at Breeden who was able to parry it away. Breeden then produced a stunning save to deny Taylor, who had stuck out a foot to divert Wadkins’ cross-shot goalwards, arcing backwards to divert the ball over the bar despite it already appearing past him. Another save quickly followed, which left Breeden needing lengthy treatment and the lull in play as players took on much-needed water seemed to dampen Chesham’s fire. Michael Williams was introduced for Rob Ogleby in the 80th minute and his marauding runs helped ease the pressure on an overworked home defence, with the substitute firing into the midriff of Legg after cutting infield. An ambitious Taundry effort was always too high while Hood showed good strength to hold off Barry Hayles as the former Fulham striker chased down a through ball. Despite five minutes of injury time, Leamington were in no mood to surrender their three points. It may not have been pretty, buy you would not have heard many fans leaving the New Windmill on Saturday evening complaining. Brakes: Tony Breeden , Ben George, Connor Gudger, Joe Magunda, Jamie Hood, James Mace, Jack Edwards, Richard Taundry (Kieren Westwood, 90), Rob Ogleby (Michael Williams, 80), Ben Mackey, Lee Moore. Subs not used: Reece Mitchell, Ellison Porter, Lewis Fenney. Chesham United: George Legg, Ashley Smith, Toby Little, Laurie Stewart, Curtis Ujah, Matt Taylor (Barry Hayles, 74), Dave Pearce (Nick Beasant, 83), Sam Youngs, Ryan Blake, Brad Wadkins, Bruce Wilson. Subs not used: Ash Fongho, Tommy Fletcher, Shane Gore.